In The Elder Scrolls V: Skyrim, Guardian Stones give players special abilities. One stone can be activated at a time, and if you've played the game, you will be familiar with them. These powers these stone offer exist only in Skyrim. 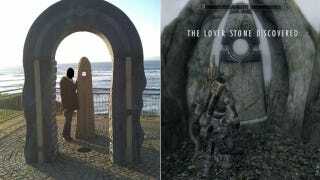 The stones themselves seem to have a real-life counterpart. Kotaku reader Brian, spotted this sea front monument in the Irish town Bundoran. "The area is one of Ireland's primo surfing areas, with surfers from all around the world coming to the small town of Bundoran on the west coast of Ireland," wrote Brian, who blurred out his lady's face for privacy. "So I can only imagine that this is in fact the Surfer Stone giving users the power of Atlantic Wave Tamer!" The work of artist Brendan McGloin, the stone sculpture dates from 2000 and is named Carraige na Nean, (Rock of the Birds). It may not be a real Guardian Stone, and it may not even be Skyrim's inspiration, but it's close to the real thing. Well, minus things like quick Magicka regeneration.